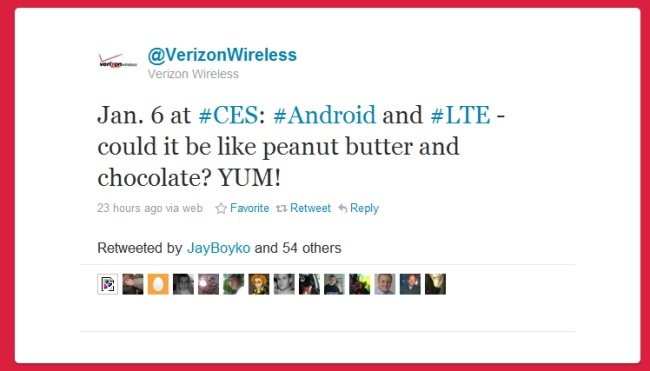 Quieting rumors that Verizon Wireless will announce a 4G iPhone at CES, yesterday the electronics maker tweeted that it will be making an announcement at CES involving Android and LTE, the technology Verizon has chosen to create its next-generation, high-speed 4G network. So what Android device will it show off on January 6, 2011, the date of its press conference? Well, probably Motorola’s new tablet, for one. Moto recently released a teaser video with CES right in the title. Due to the success of the Droid partnership Motorola and Verizon embarked on a year ago, it’s likely a Moto tablet would be one of Verizon’s flagship products. The big question is whether a VZW iPhone 4 will be announced at the show. It’s certainly not Android. Then again, perhaps the LG Optimus 2X or Droid Incredible HD will be LTE. What phones/tablets would you like Verizon to unveil with 4G capabilities?